Darcel Rideout with licensed clinical social worker Joanna Goldstein at the Cohen Clinic. Back in November, Darcel Rideout was not in a good place. The chemical warfare specialist and weapons marksmanship instructor with the Pennsylvania National Guard had been struggling with depression ever since she gave birth to her son in 2014, and was now having thoughts of suicide and homicide. A new clinic had opened on the University of Pennsylvania campus, and a private organization, Military One Source, thought the facility might help her out. "I called the clinic, had a screening over the phone, and they made an appointment with me the very next day," said Rideout, 27, of Philadelphia. "I was really worried about exposing myself to strangers — that's what comes with military training." Six months later, Rideout is on the advisory board of the Steven A. Cohen Military Family Clinic, at 3535 Market St., one of five mental-health centers of its kind in the country created to fill in the gaps in existing services. Seven other clinics are expected to open by the end of 2017, said Anthony Guido, a spokesman for the association. The clinics are free for both veterans and their family members. They focus on serving people who aren't eligible for Veterans Administration services, mainly certain National Guard veterans. They also accept those who have been dishonorably discharged, said Philadelphia clinic director Leah Blain. She said that they now serve about 200 clients, including children. The VA, she said, cannot serve family members independently, although it offers some couples counseling. At the Cohen clinic, things aren't so limited. "The idea is to be able to integrate the family into veteran care – if someone comes home with PTSD, it impacts the whole family," Blain said. "We recognize that being family to a military member comes with unique stressors." Although Rideout now feels that she is "in a sane place," she recognizes that it's an ongoing fight to recognize triggers and stressors that could send her spiraling. She hopes to use her story to encourage others to come forward and get help, particularly those who have been turned away elsewhere. "A lot of the military are not supportive of people who are depressed or who have mental illnesses and disorders," she said. "The commanders don't always know the signs of mental illness or disorders, and so those behaviors can be overlooked for such a long time." Behavioral-health issues for service members have been on the rise for the last several decades, Blain said. 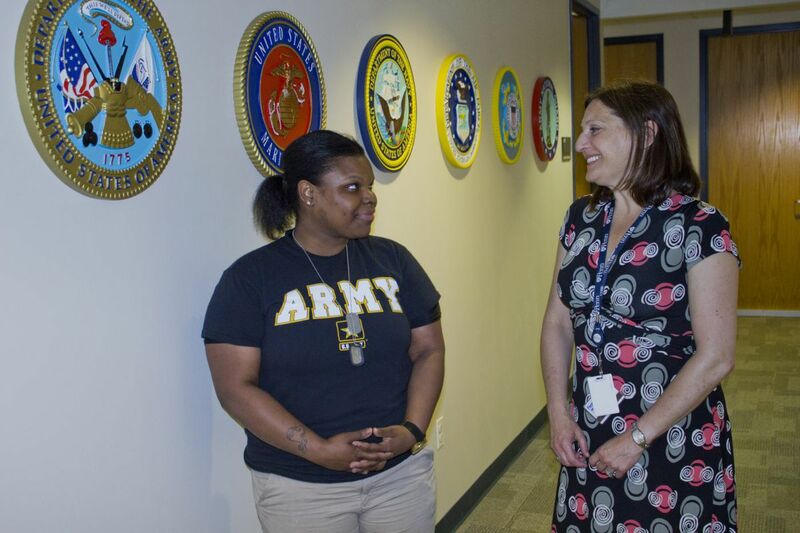 The VA and the Department of Defense have expanded services for illnesses such as depression and PTSD, and both advocacy and civilian groups have made strides on reducing the stigma in seeking help for mental illness. But there is still "a ton of work to do," Blain said. According to the VA, in 2014, an average of 20 veterans died from suicide each day – 18 percent of all deaths from suicide among U.S. adults — and six of the 20 were users of VA services. Service members face unique barriers in that their mental-health issues are open to their employers, so they are concerned about promotions or having their duties limited if they seek help for mental issues, Blain said. Even after active duty ends, there are still worries about career implications such as limiting security clearance. "In the military, the chain of command has access to their medical records because they need to be fit for the duties they have to perform," Blain said. "So the mind-set is different. It's not a private matter like in the civilian world." Pete Freudenberger is an Army veteran who serves as outreach coordinator at the Cohen clinic, and who worked at Bucks County Veterans Center and the Philadelphia VA Medical Center. He says one of the challenges of his job has been trying to reach out to post-9/11 veterans who have not been to the VA or thought they had a negative experience there. They are working with military hiring fairs as well as universities. He said it's particularly important for veterans to work with people who understand their challenges. Military families move frequently. Children are separated from parents for long periods of time, and spouses sometimes feel like single parents. And that's all before the military member comes home. Sometimes that's when the real struggle starts. "You're transitioning back into civilian life where you have no job, no money, and you haven't been paying bills for years and suddenly you have to budget," Freudenberger said. "You've been having all your meals prepared for you and suddenly you have to figure out how to cook and feed yourself." The clinic is starting to offer group therapy, and is thinking about adding telehealth options to reach more veterans in rural areas, Blain said. Rideout is trying to get other veterans involved and into the clinic. "We're taught to be the strongest people in the world and we're taught to push our mental health aside and maintain our physical health," she said. "We're not trained to be mentally fit."